E Phillips Fox, one of a generation of late 19th-century Australian expatriates in Europe, is renowned for his cosmopolitan and superbly coloured images painted in Paris. party and immerses us in a sumptuous, genteel world of vibrant colours, luscious fabric textures and warm summer atmosphere. 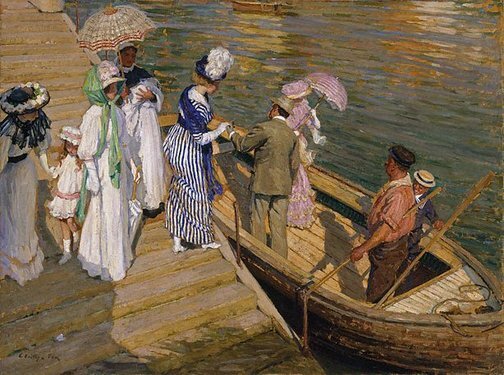 Originally exhibited in Paris and London, 'The ferry' also influenced a younger generation of Australian modernist artists when it was exhibited in Sydney in 1913. Signed l.l. corner, black paint "E.Phillips Fox". Not dated. Betty Churcher, Australian notebooks , 'Art Gallery of New South Wales', pg. 45-90, Melbourne, 2014, 44-45 (colour illus., detail), 66 (colour illus. ), 67, 70, 254, 255. Georgina Downey, Art, love and life: Ethel Carrick and E Phillips Fox , 'Cosmopolitans and expatriates', pg. 57-65, Brisbane, 2011, 57, 58 (colour illus.). Mary Eagle, Creating Australia: 200 years of art 1788-1988 , '"Nature Must be There"', pg.166-167, Melbourne, 1988, 8, 166, 167 (colour illus. ), 237-238, 245. Deborah Edwards, Look , 'Beauties of the Belle Epoque in Australia', pg. 16-18, Sydney, May 2011, 16-17 (colour illus. ), 18. Bruce James, Art Gallery of New South Wales handbook , 'Australian Collection: Painting and Sculpture', pg. 102-181, Sydney, 1999, 131 (colour illus.). Barry Pearce, Parallel visions: works from the Australian collection , 'Introduction: Convergent Spirits', pg. 10-19, Sydney, 2002, 12, 26, 28, 31 (colour illus. ), 143, 147. Barry Pearce, Australian art: in the Art Gallery of New South Wales , 'Introduction', pg. 10-16, Sydney, 2000, 15, 73 (colour illus. ), 74, 80 (colour illus. ), 81 (colour illus., detail), 300. Barry Pearce, Art Gallery of New South Wales handbook , 'Australian', pg. 13-35, Sydney, 1988, 20, 23 (colour illus.). 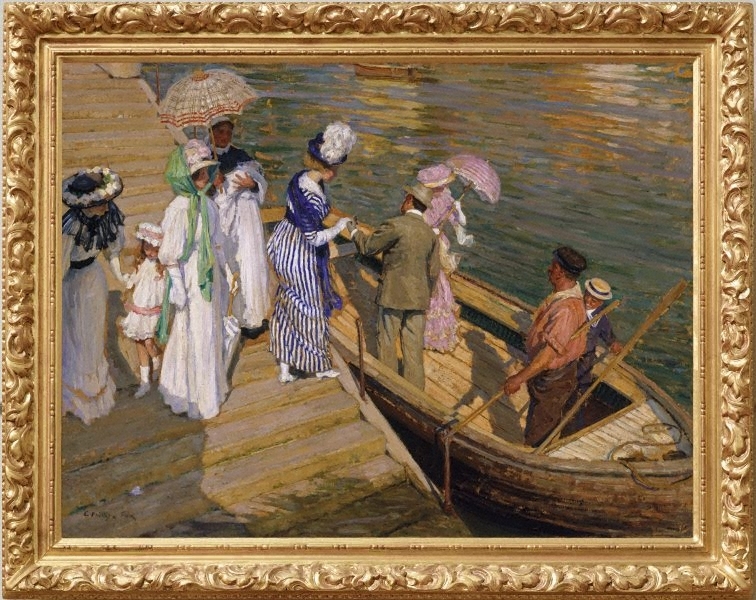 Ruth Zubans, Painted women - Australian artists in Europe at the turn of the century , ''Mr and Mrs E Phillips Fox: images of women in the work of Emanuel Phillips Fox and Ethel Carrick Fox', pg. 15-18, Western Australia, 1998, 17. Painting , London, 1961, 14 (illus.). Important Australian art , Sydney, 28 Aug 2018, 87 (colour illus.). Look , 'Society's "perfect memorial" to Margaret Olley: flowers and an artist whose work she loved', pg. 15, Sydney, Nov 2011, 15, 49 (colour illus.). Art Gallery of New South Wales: highlights from the collection , Sydney, 2008, 66-67 (colour illus.). Through artists' eyes: Australian suburbs and their cities 1919-1945 , 'The city observed to the city experienced', pg. 71-100, Melbourne, 2004, 79. Museum National , 'Parallel Visions at the Art Gallery of New South Wales', pg. 8, Fitzroy, May 2002, 8 (colour illus.). Parade: The story of fashion in Australia , 'Towards a New world', pg. 59-75, Pymble, 1998, 65 (colour illus.). Roy and Matilda - The Golden Locket , Canterbury, 1994, colour illus..
AGNSW Collections , 'From Colonialism to late Modernism', pg. 7-106, Sydney, 1994, 27 (colour illus.). Portrait of a Gallery , 'Australian Art in the Old Courts', pg. 24-37, Sydney, 1984, 29 (colour illus.). Australia's national collections , Sydney, 1980, 258 (colour illus. ).